List Rules Vote up the traditions you think are the coolest and most storied. From racing anthropomorphic sausages to the deafening sound of cowbells, there are plenty of oddly specific traditions in the world of baseball. Make sure to commit some John Denver to memory before attending an Orioles game and be prepared for the boisterous presence of the "Bleacher Creatures" if you happen to catch a game at Yankee Stadium. These old traditions in baseball often have origins that have been lost with time, or ones so shrouded in local legend it's hard to untangle fact from fiction. However, you'll find rabid sports fans don't particularly care about the backstory. Sports can give people a sense they're part of a world bigger and older than themselves, and these baseball team rituals feed into that. Some funny rituals in baseball make complete sense. Given the Washington Nationals play their home games in D.C., of course they would have a Presidents Race featuring caricature blow up heads of the nation’s former presidents. It also makes perfect sense that the song “New York, New York” is played at the end of every New York Yankees home game. But what on earth does the song "Thunderstruck" have to do with the White Sox? And why is a plush monkey necessary to cheer on the Angels? We may never know for sure, but - in some ways - it doesn't really matter if it makes the fans happy. You can read up on these and other weird baseball traditions below. Vote your favorite rituals to the top of the list! If you miss the stadiums, catch all of the MLB games for 2018 live streaming on Fubo.tv! Try it for free! What goes better with watching a summer baseball game at the stadium than an ice cold beer and a sausage sandwich? The Famous Racing Sausages got their start in Milwaukee in the early 1990s as a simple cartoon racing on the scoreboard at the old County Stadium. Over time, the race became such a fan favorite that an actual sausage race started with Bratwurst, Polish, and Italian sausages. 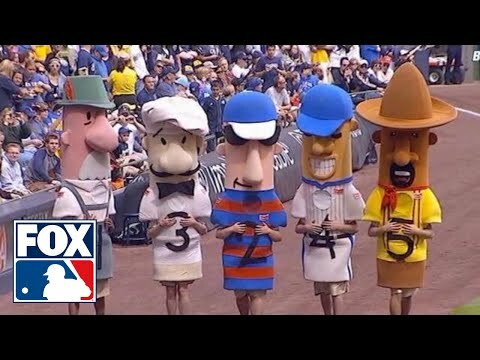 Today, during the bottom of the sixth inning, five sausages (Brett Wurst the bratwurst, Stosh Jonjak the Polish sausage, Guido the Italian sausage, Frankie Furter the hot dog, and Cinco the chorizo) head off in a wild race around Miller Park. Is this a fun tradition? It only makes sense that a stadium located in the nation's capital features a Presidents Race. 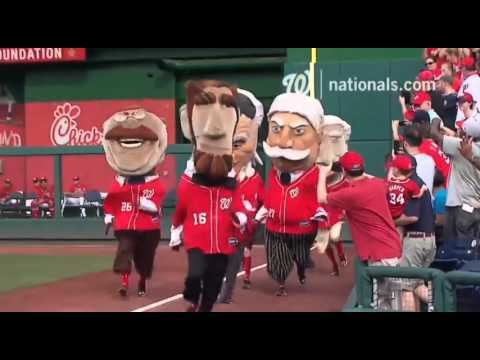 During the fourth inning of every Nationals home game, a group of America's presidents - with enormous caricature blow up heads - race around Nationals Park. The always entertaining race started in 2006. As of 2018, the contest includes George Washington, Abe Lincoln, Thomas Jefferson, and Theodore Roosevelt. The St. Louis Cardinals may play their home games at Busch Stadium, but it's the Budweiser Clydesdales that are part of the storied team's tradition. 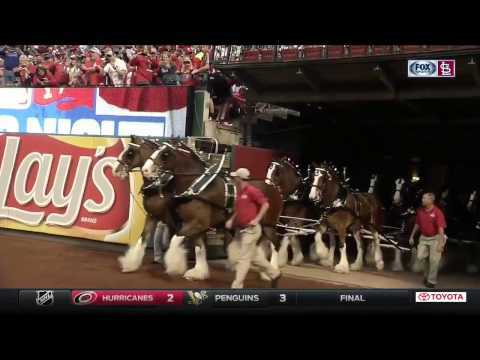 During Opening Day every year in St. Louis, a group of patriotic-clad Clydesdales do their token high-step around the warning track of the stadium's outfield. Some Cardinals fans think that the horses bring the team luck. "We had the exclusive for a long time," Cardinals owner Bill DeWitt Jr. said, "But the Clydesdales are great. They are part of the Anheuser-Busch brand, but for Cardinal fans they are part of Cardinal baseball." The Mets play in New York City, AKA the Big Apple. So it's only fitting that every time a Mets player hits a home run in Queens, a giant red apple with a Mets logo rises and lights up over top of center field. The tradition started at the old Shea Stadium in the 1980s. It continues on at the Mets new stadium Citi Field.